In lieu of a new Featured Team this week, I think it would be great if everyone posted their favorite 6 Pokémon. No moves, stats, or anything, just your dream team, even if it would be a horrible team. I admire when SBJ went to Nationals last year, for VGC, because he didn't take a "normal" team but one with Pokémon that he liked. I think that VGC Championships and increased competitive battling have made us sacrifice Pokémon we love with Pokémon who are "good" for competitve battling. So please, go in the comments and list off your 6 Dream Team. 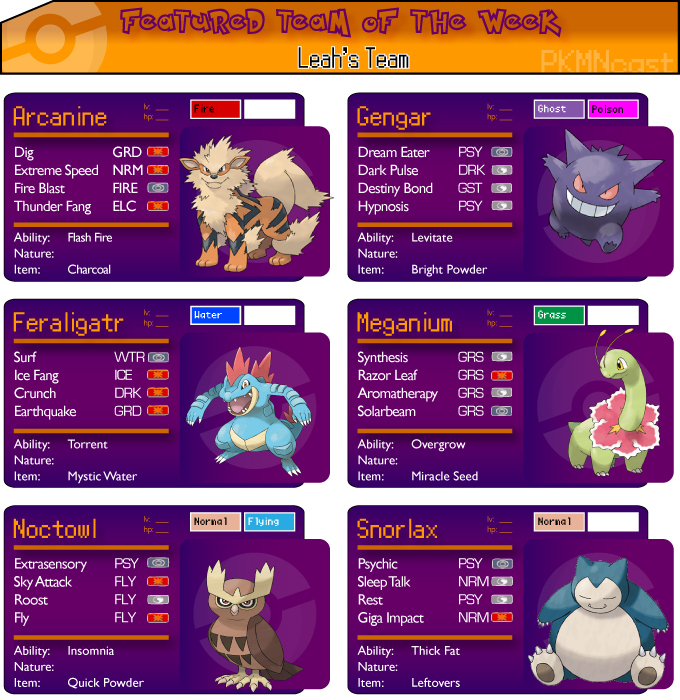 Also, my favorite post will be next week's Featured Team. List names if you have them. I've never named my Pokémon but I LOVE hearing names!